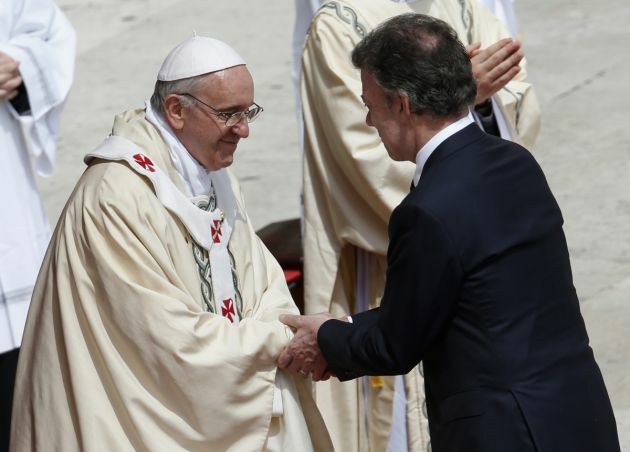 (Photo: Reuters / Tony Gentile)Colombia's President Juan Manuel Santos (R) shakes hands with Pope Francis as he leads a canonization mass in Saint Peter's Square at the Vatican May 12, 2013. The Pope is leading a mass on Sunday for candidates for sainthood Antonio Primaldo, Mother Laura Montoya and Maria Guadalupe Garcia Zavala. Montoya is the first Colombian to be canonized by the Roman Catholic Church. The Vatican seemed at pains not to allow the first canonizations of Francis' two-month-old papacy to be interpreted as anti-Islamic, saying the deaths of the 'Otranto Marytrs' must be understood in their historical context. "While we venerate the Otranto Martyrs, we ask God to sustain the many Christians who, today, in many parts of the world, right now, still suffer violence and give them the courage to be faithful and to respond to evil with good," Francis said before more than 70,000 people in St. Peter's Square. A booklet handed out to participants said the "sacrifice" of the Otranto Martyrs "must be placed within the historical context of the wars that determined relations between Europe and the Ottoman Empire for a long period of time". Francis' predecessor, Pope Emeritus Benedict XVI, made a speech in Regensburg, Germany, in 2006 that was perceived by Muslims as equating Islam with violence. Roman Catholic sainthood requires that two miracles be attributed to those who are being made saints - one before beatification, and another before canonisation. In the case of the 800 Italians, the requirement for the first miracle was waived because they were killed "in hatred of the faith". At Sunday's ceremony, Francis also proclaimed Colombia's first saint, a nun who died in 1949, and canonised a Mexican nun who died in 1963. At the end of the Mass, he made his first appeal as pope against abortion, saying life must be "respected from the moment of conception" and throwing his support behind an Italian group promoting legal protection for embryos.